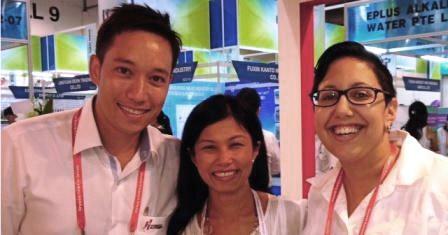 During the recent Food and Hotel Asia trade fair held in Singapore, Stockyard staff had the opportunity to meet Audra Morrice, a finalist in Masterchef Australia 2012. As a child, Audra grew up in multicultural Singapore, and this rich mix of cultures instilled a lifelong love of good food. Since her time on Masterchef she has parlayed this love of Asian inspired food into a successful business in Sydney, where she shares her passion catering, speaking and teaching cooking. Her love of both sweet and savoury combined with her upbringing in Asia has created a truly eclectic, modern yet familiar style of cooking. “Lightly marinated in smoked salt and lemon infused avocado oil, seared on both sides till nicely charred, then straight into the oven until the beef is cooked till medium rare. It’s really important to then let the beef rest after cooking; this allows all the muscles to relax and helps seal in the juices, resulting in an amazingly tender juicy piece of meat. We were truly excited to hear of Audra’s use of Stockyard Wagyu, which is undeniably aligned with our ethos of innovation with food.